If you want to improve your oratory skills, the president of the United States is a great person to learn from. Read on to discover why. (From Madrid) IN JANUARY OF 2005, Barack Obama had just won his seat in the United States Senate. He gave a press conference the day before he was sworn in, and a journalist asked him: Senator Obama, what is your place in history? He laughed and thought: Place in history? You must be kidding. I’m not even sure the other senators will save me a place at the cool lunch table. Defending his political ideals has remained a constant throughout his political career; as such, a great deal of the promises that he made during his campaign are now leading to legislative measures in order to reach those ideals. This is why the decisions that President Obama has been making since he took office on January 20, 2009 cannot surprise me, or anyone who is familiar with what he has said in the past. Issues like Guantánamo, the economic recovery, health care, energy, the wars in Iraq and Afghanistan. Everything is unfolding like promised in his electoral program – nothing more, nothing less. And yet, what is the secret to Obama’s oratory skills? Why has he been able to reach the people so well, and not only Americans, but also people in many other countries around the world? The answer to this question is not simple. 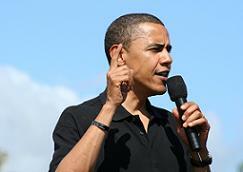 Barack Obama possesses a series of qualities that make him a great orator. Let’s review them. In the first place, his great emotional intelligence stands out. When Daniel Goldman, author of the famous best-seller Emotional Intelligence, traveled to Spain in October of 2008, he did not mention the then presidential candidate on three separate occasions by accident. Goleman knows that Obama has the prerequisites for being an emotionally intelligent leader: self-awareness, self-regulation, motivation, self-esteem, empathy and social skills. If Obama hadn’t believed in himself enough, would a black man with a funny name, as he defines himself, have thought that he could win the presidency of the United States? “His non-verbal language is simple, based on a magnificent stage presence, a smile that lights up the world and a hand that reaches out from the heart and brings him closer to his audience” His ability to control his emotions, as well as his excellent ability to empathize, learned from his mother, are why he knows how to react appropriately in any situation. In my public speaking classes I explain that there are three basic keys to reaching the public: naturalness, humbleness and heart. The first consists of being ourselves, without attempting to look like anything else. This is useful when facing any problem that might arise during a conference, and it spares us the fear of making a fool of ourselves. Humbleness reminds us that we cannot simply decide that something is true, and as such, that we can make mistakes. Speaking from the heart makes the audience understand what we are trying to say, and it affords us credibility. Obama employs all three things very well. In his speeches, he is able to make mistakes and ask for forgiveness, to admit that he is not a perfect man. And he has always said it: I will not be a perfect president, and with this, the things that truly matter go straight to the hearts of the people listening to him. Obama also has a good voice, which he knows how to employ to great effect, masterfully using silences and pauses, and taking on different intonations according to the moment. His non-verbal language is simple, based on a magnificent stage presence, a smile that lights up the world and a hand that reaches out from the heart and brings him closer to his audience. From the very beginning of his electoral campaign, Barack Obama’s message was one of hope, change and action, appealing to the unity of everyone: There is not a liberal America and a conservative America – there is the United States of America. There is not a Black America and a White America and Latino America and Asian America – there’s the United States of America. He used these words for the first time when he gave the keynote address at the 2004 Democratic National Convention in Boston. His rhetoric is reminiscent of that of Abraham Lincoln, the Kennedy Brothers – both JFK and Robert -, Martin Luther King and others. “With a better sense of humor than her husband, the First Lady of the United States makes her audience smile within the first five minutes of her talks” And it was these people whom Obama has looked up to since he was a young boy. In fact, it was his mother who placed the speeches of these great figures in American history in her son’s hands, for him to learn. The presence of his wife Michelle is also part of his success. She is as good of a speaker as he is, and has given him constant advice on how to speak from the heart. With a better sense of humor than her husband, the First Lady of the United States makes her audience smile within the first five minutes of her talks. She deserves credit for that. Of course, Obama needs the backing of a good team like the one he has assembled: a group of speechwriters that have managed to forge a stupendous relationship with their boss. Twenty seven year old Jon Favreau, the most popular of them, met the president at the 2004 Democratic National Convention, and began to work for him a year later. Despite doing a good job speaking in public, Obama was accused during the campaign of not being Black, White, rich, poor, Christian, Muslim, American or African enough. In other words, ethnic groups were clinging to one of those faults, using it as a way of going against him. However, it is perhaps this very mixture, being a little bit of everything and not a lot of anything, that made it possible for him to be in the White House today. It is not so much that he is a Black president anymore – this is merely incidental – but, as George W. Bush said when he got back to his ranch in Texas after leaving Washington behind: Today is a great day for America and a good man took the oath of office. If Mr. Bush wants to improve his oratory skills, Obama is a good person to learn from. I invite him to do it.